Can Iiyama stand out in the crowded £150 Full HD monitor arena? With prices tumbling and specifications on the up, Iiyama's LED-powered 22-incher is good, but isn't quite at the head of the pack. When it comes to screens, bigger isn't always better. At least, that's the hope for the new Iiyama E2271HDS. By most metrics, it looks thoroughly competitive with the £150 monitor brigade. But at just 22 inches in overall screen girth, it's a little short on stature. The LG E2350V, for instance, is cheaper but an inch larger. 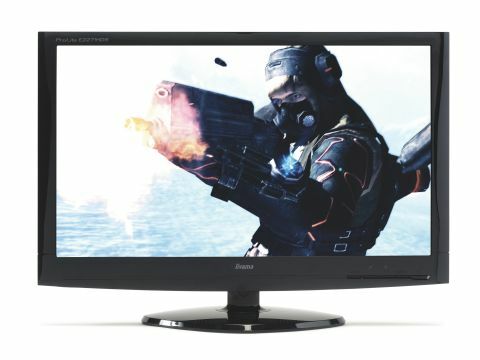 Meanwhile, the BenQ EW2420 is available for just a few quid more but offers an extra couple of inches and a VA LCD panel. The BenQ's VA panel truly is an anomaly at this price point, so we won't hold the Iiyama E2271HDS's TN alternative against it, even if it is inferior LCD panel technology. While the E2271HDS might be smaller than some of the competition, it's still a Full HD panel, packing 1,920 x 1,080 pixels and sporting an LED backlight. Of course, the same pixel count in a smaller screens translates into a tighter dot pitch. And that means sharper images and greater clarity.